Worksop’s newest boxing hero Dylan Clegg made a statement in his professional boxing debut at the North Notts Arena. Trained by Michael White at the Fighting Fit Gym, the 20-year-old finished his Bulgarian opponent Tsvetozar Iliev (6-24-1) in the fourth and final round of his pro bow with just 49 seconds left in the fight. Super-middleweight Clegg said of his performance: “I kept on the jab, figured him out, boxed comfortably for all of the rounds, so I picked the pace up in the last round and stopped him. The popular 168-pounder was roared on by a 200-strong crowd of supporters. “I’m quite well known around my local area and everyone that said they would come all came out to watch. The support was the best in the arena on the night and a lot of people were on holiday, so I could even get a bigger crowd watching next time,” he said. The former schoolboys finalist experienced 25 fights in the amateurs but turned pro when he became disenchanted with the unpaid code. “I got to the schoolboys finals four times and the championship finals once,” he said. “James Richardson, a Team GB boxer, robbed me in finals and I found out it was live on TV afterwards and I was very upset about that because I should have won. Managed by Scott Calow, Clegg has plans to stay active, eyeing September for his next fight. He added: “I just want to stay active. The next home show is around November, but I wouldn’t mind getting out earlier in September. 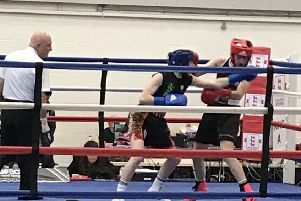 While on the rest of the card on Saturday’s Hope & Glory event at North Notts Arena, put on in association with Scott Calow Boxing, Kyle Fox (6-0) headlined the exciting eight-fight card. The Doncaster fighter landed the British Challenge belt with a landslide points win over Islington’s Jordan Grannum (3-27) in what was the first ever title fight staged at the Worksop venue. While, included on the card, super-lightweight prospect Sonny Price, 21-year-old from Swallownest, moved up to 4-0 with a 40-36 points win against 297-fight veteran Kristian Laight (12-276-9). And the evening didn’t end there with local Langold’s Luke Middleton kicked off his pro career with a debut win against Hyde’s Dale Arrowsmith (1-17-1).